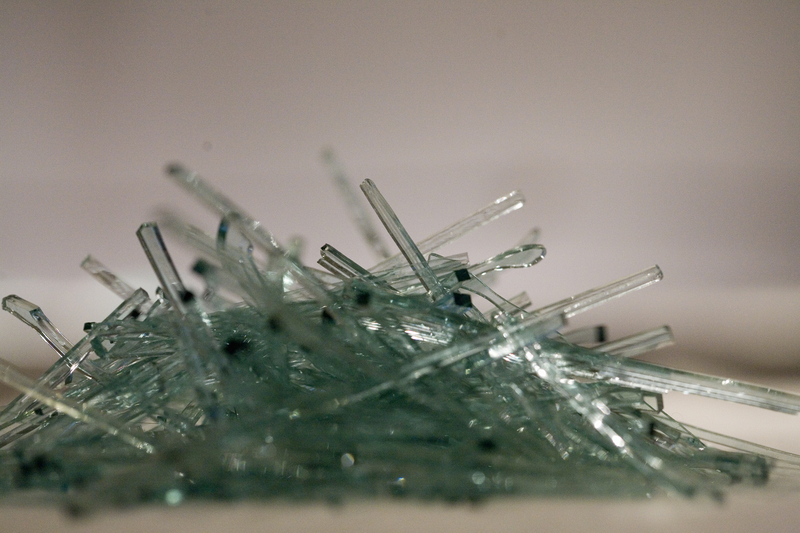 On Detroit streets, it is common to come across piles of glass from broken car windows. It is easy to overlook these ‘city diamonds’ that quickly become scattered in traffic. In a city built on the auto industry and struggling to overcome a variety of social and economic setbacks, it is fitting to seek value in remnants of cars and crime. For this project, we collected many piles of broken window shards in our neighborhood, leaving the streets temporarily free of glass and reminders of violence. 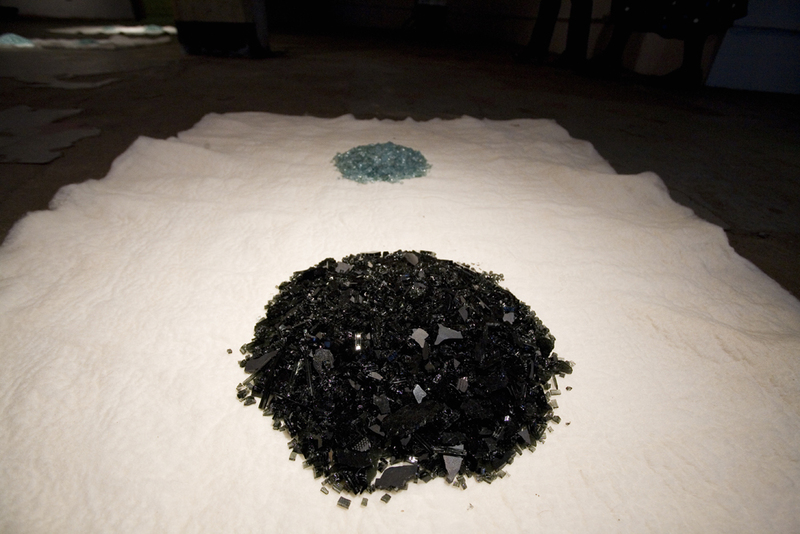 After sweeping up the glass, we meticulously washed and sorted it, taking out all stones and debris, and created wool felt to place underneath it.The materials of felt and glass have been imbued with social and spiritual significance for artists such as Joseph Beuys and Mierle Laderman Ukeles. Through their work, both artists emphasize the ability of creative energy to transform objects and actions, recognizing connections between arts and healing. Felt is recognized for its protective properties of strength and warmth. We formed the material into blanket-like panels recalling the comfort of home, though it also reminds us of the needs of those who are homeless in Detroit. Though the time intensive processes we undertook to create the felt and clean the glass echo the monotonous repetition of factory labor, we found the experiences meditative and rewarding. Working to wash, sort, and clean, we were able to transform the glass, revealing its jewel-like quality and underlying beauty. In a building where factory workers once labored, we hope viewers will find a meditative space that will allow them to reflect on the transformative process of labor. We’ve all seen the evidence: the square crystals of pale, blue-green glass on the street; detritus left behind by car thieves. The bits of glass give silent testimony to the extreme strike force, muscle power and heavy object, used to shatter windows and psyche. Violence, physical and emotional, reduced to glittering glass. Seldom is it swept up. It is left as if to mark the spot; document the impact. Ignored, it moves closer to the curb. Hundreds of thousands of tires acting like glacial boulders move the crystals of tempered glass incrementally to the edges of streets and roadways. In gutters it mixes with dirt and urban grit as if it might eventually be reduced to the silica from which it was made. Nevertheless, it sparkles and glints, catches our eye, reminds us of the violence, the victims, the thieves; the denial, disbelief, loss, anger, bitterness, and pain; the rising insurance rates, the inconvenience and expense, the time lost, police reports; the uneasiness, waiting and hope; the replacement. Most of all our eyes are assaulted by the knowledge that it could, and does, happen again, and again, and again. Auto theft and vandalism is the SLIP in respect for personal property that plagues Detroit and all urban areas. Alana Bartol, Liz Bernblum, Emily Linn, and Lindsay Satchell took note of the amount of broken auto glass in the gutters and curbs around Wayne State University. Linn had her car stolen twice, so she was particularly sensitive to their findings. These four graduate students decided to SHIFT their response to the broken glass and all it represented. Equipped with dustpan, floor brush, broom, bucket and video camera, the four women first collected the curbside glass with the idea that they would SWITCH the perception of it as evidence of urban violence and decay to something beautiful that evoked a sense of healing and peace. Rather than gather the glass, dirt and all, and just dump it on a gallery floor with statistical information about the date, location, and amount gathered at each site, they chose a longer, more arduous process. They purified the glass by sifting out the dirt and debris, washing it and letting it dry, sorting it by color and shape, discarding broken bottle glass. As if this was not labor intensive enough, they made 9 hand-felted blankets of white, virgin wool on which to present it. 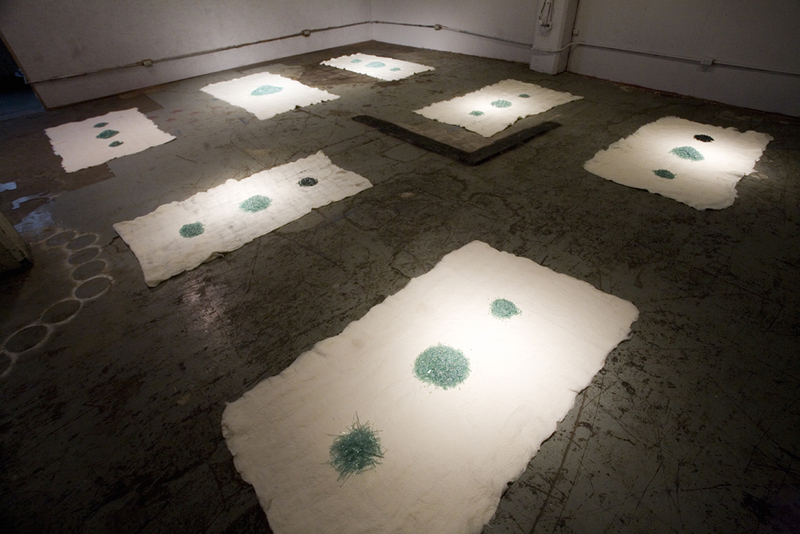 Entering the gallery you see the felt blankets gleaming white, arranged on the scarred industrial floor like meditation/prayer rugs in temple or mosque; pallets for naps in a nursery school; sheets for the homeless in shelters; platters to accept offerings in sacred spaces. On 8 of the blankets there are three piles of glass; on the ninth one there is only one larger pile of glass. The piles are formed naturally by the pouring out of the glass…not unlike offerings in temples or presentation of spices in open markets. On the factory windows at the back of the installation, is a schematic map of the locations where the glass was gathered. 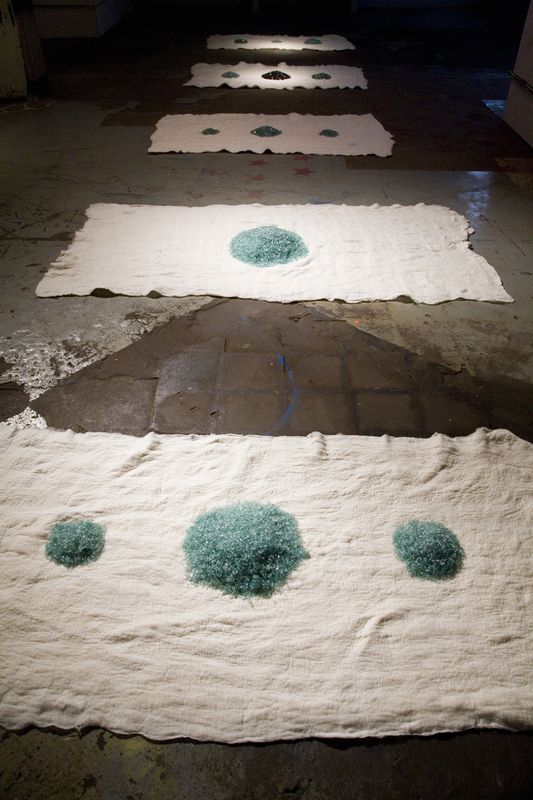 In the far left of the gallery, three video monitors play continuous presentations of 1) the gathering process; 2) the purification process; and 3) the felting process. The videos are without narration and so well edited by Bartol and Linn as to be mesmerizing. The ambient sounds of the sweeping, scraping, washing/sorting, and felting add to the soothing effect of the installation. Cleaning city gutters by hand and working quietly against the background of empty buildings, parked cars, hospitals, restaurants and local traffic became their act of reclamation. This was not glamorous work. It was humbly and effectively done. Sifting out the spent and useless soil with ordinary mesh strainers and letting it fall among weeds became a gesture of renewal and hope. Dirt it was and to dirt it was returned, to be enriched by decomposing plants and hard working worms. This was an ecological SHIFT unconsciously discovered as the process unfolded. Washing the glass using buckets and a garden hose as well as sorting all the glass with their fingers added a gentle intimacy to the process that nullified the brutal stroke that had broken the glass in the first place. This was another aspect of the SHIFT from treating something like trash to panning for “urban diamonds” by touching each and every one. The counting trays themselves were sumptuous bowls and platters in jewel-toned colors when they could just as easily have been quotidian plastic lids or aluminum pie tins. This simple refusal to treat the broken glass as trash, to place it in beautiful containers even during the preparation process indicated that a SWITCH in attitude toward the glass was almost complete…that reverence and respect can create a change in our internal as well as external environment. Rolling the wet and wrapped woolen fibers until they matted together to form the blankets was a supple, muscular practice that created its own rhythm. Working together using their forearms, Bernblum and Satchell set up a rhythm experienced around the world by people working in tandem at the same task. Their bodies moved as one.The artistic process of creating this installation became one of reclamation and reconciliation. Dolores is familiar with the heart-stopping discovery of broken auto glass on the street in front of her Detroit home.